The Findon hotel is a nice mix of family friendly environment v’s traditional pub. 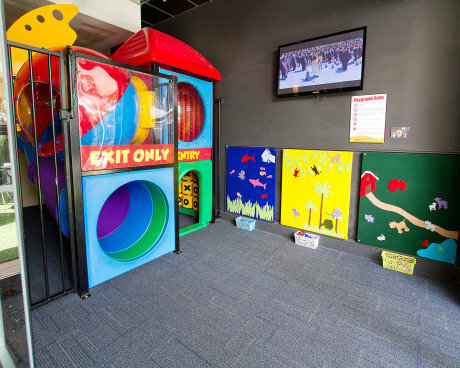 The kids will be happy playing in the indoor playground and when they need a rest they can sit on the carpet and watch the tv which has children’s movies playing. There is also some boards with felt characters to stick on to them which the younger ones enjoyed on our visit. Whilst sitting at the table kids will be entertained by the colouring in sheets and pencils that are provided. The kids menu has a good range and is good value at $8 per meal and includes a couple of healthier options. The adults menu is quite extensive and prices vary accordingly, but there are good specials on a number of days that will enable you to try some higher priced items at a good value price including 50% of adult main meals on Wednesday’s (max 4 per table). Other specials include Kids Eat Free on Tuesday’s at lunch and dinner and there are lunch specials daily with prices from $11.90. The Findon Hotel is a lovely place for a family meal with some great activities to keep the kids happy and if you get a chance to go without the kids there are areas well away from the play area to enjoy your meal and an adult conversation.